With a slowing resources boom and a worrying housing bubble, is Australia prepared for good times to end? Australia’s 23-year economic winning streak has made its 23 million citizens reportedly the richest in the world. Yet with the China-driven resources boom slowing and worries over an overheated housing market, commentators have questioned whether the good fortune of the “Lucky Country” may soon run out. The Diplomat spoke to ANZ senior economist, Justin Fabo on Australia’s outlook and whether the warnings of a sustained downturn should be heeded. Bloomberg’s William Pesek and other commentators have asserted that Australia is over-reliant on China and the nation’s housing bubble is set to pop. Do you agree? It’s a tricky one because elements of that view we agree with. Certainly there are challenges for Australia over the next five to 10 years, not just short run challenges but medium term ones. The key one is around commodity prices – we had this big run-up in commodity prices and in our terms of trade over an eight to 10-year period, and that was largely a China story. Now that is starting to unwind to some extent and the terms of trade are back to 2010 levels, so it’s come off around 20 percent. That’s a pretty big fall and we think it will fall more. The key question is how far it will fall and how quickly. The pessimists think it will be big, but we’re pretty much middle of the road. The key question is where you think the balance of risks is – on the way up everyone was surprised by how high the terms of trade went and hence how large the free kick to the economy was; the risk is on the way down that things fall more quickly than we expect. Fundamentally though it comes back to your China view. While there may be slightly skewed risks around the Chinese economy, and you can easily pick out some downside risks to growth, you have to remember that growth there has already slowed significantly. It’s slowed from 10 percent per annum on average for 30 years (and 14 percent in 2007) down to around that 7 percent mark. So while they have challenges, particularly around their property market, and there’s a pretty sharp cyclical slowing in their housing market at the moment which will probably persist for some time, that means there’s little upside risk to commodity prices such as iron ore and coal over the next couple of years. But we’re not expecting a big further shakeout in those prices. You’d need further sharp falls in iron ore and coal prices to support this story that Australia’s outlook is significantly threatened – for that to happen you’d need China to look a lot weaker than it is at the moment. Concerning the domestic housing market debate and whether that’s a risk to the economy, the key one there is that it’s not a risk in of itself, as we have seen some deleveraging in our household sector since the GFC with borrowing activity at a much less rapid pace than in previous up cycles, although the level of gearing is still relatively high amongst households. That’s OK as long as they can service it, and if things turn out OK in the next few years we have no doubt that households can service that debt. But the key one is if the economy is hit by a big negative external shock, then having high gearing, whether in the household or business sector, that’s where the risk is. Unemployment has risen in Australia to now surpass the U.S. level, but according to ANZ the labor market is showing signs of improvement. Have we hit peak unemployment, some volatile data from the Australian Bureau of Statistics (ABS) notwithstanding? The ABS numbers have thrown a spanner in the works….but we always watch a range of labor market indicators, and most of those that we look at, whether it’s our job ad series, hiring intentions, firms’ views on spare capacity, they’re all pointing towards a gradual improvement in the labor market. Normally when you’ve got job ads rising you get some improvement in the unemployment rate. We haven’t seen that on the ABS numbers – over the past four to five months it’s flatlined at around 6 percent. So those numbers are showing the pace of deterioration has slowed, and when we look at all those indicators we do think there’s been some improvement already in the labor market. Has the jobless rate peaked? It’s at 6.1 percent at the moment; our forecasts always had it peaking at around that level and we haven’t changed that. The key one in terms of the outlook is how quickly it improves. That’s where we share the RBA’s [Reserve Bank of Australia’s] view that with the challenges to growth, we don’t see significant improvement in the unemployment rate for probably another year. We’re seeing it around that 6 percent mark for a number of months before it slowly improves, but not until about mid-next year when it starts to improve more quickly. Looking at Australia’s economic growth, we’ve seen a transition of growth away from the “mining states” such as Western Australia and Queensland to others such as New South Wales (NSW) and Victoria. Is this still happening and how do you see our GDP growth in the year ahead? That transition is happening – the indicators we point toward are for example retail sales. Growth in retail sales in the non-mining states has picked up pretty sharply, particularly in NSW, and it’s slowed sharply in the mining states of Western Australia (WA), Northern Territory (NT) and Queensland. The other thing clearly showing the transition is population growth, which is slowing in Queensland, WA and the NT, particularly from rapid rates in WA, but it’s picking up in NSW and Victoria. So we are seeing that switch in the growth drivers happening. The key question is how quickly it happens – we’d probably like to see it happen more quickly. For GDP growth, we’ve got it at around 3 percent for this year and next, before it steps up a little in 2016. The RBA has kept interest rates at record lows but ANZ is predicting the first rate hike in May 2015, can you explain this forecast? We’re expecting back-to-back increases next May and June and then the RBA pausing, seeing how the economy takes it, and maybe getting another increase later in the year. It’s about 100 basis points over the first 12 months. It sounds a lot but historically it’s not – it’s actually quite a slow initial tightening phase. The other point is how much conviction we have in that view – you always like to have a lot, but at the moment there’s a lot happening in the economy with different forces, so our conviction in that call is probably a little bit lower than normal. There are a number of things that tell you that they could wait longer than mid-next year. One of those is what they do with other policies to target parts of the housing market, and when they’re brought in and how effective they are in dampening the investor part. So that will be important. The other one is what the currency does and what commodity prices do combined with that, so there are a lot of moving parts. But stepping away from that, our view is we’re already seeing this transition happening in the economy with the non-mining part of the economy improving, even though mining investment is coming off. By mid-next year there should be enough evidence that you don’t need the [RBA] cash rate at 2.5 percent any more and you don’t need lending rates at record lows. The RBA has never hiked before the unemployment rate has peaked and they typically wait at least a couple of months to make sure it is falling before they start to increase rates, so the key one to watch will be the unemployment rate over the next six to nine months. There’s been much talk of a “housing boom” in Sydney and Melbourne. Is there any danger of this overheating and does the RBA need to act, whether through interest rates or other measures? The hottest part of the housing boom has been in Sydney, where until recently a large part of the house price increases and building activity have been playing catch-up. If we look at prices now we’d have to characterize them as fully priced, but that doesn’t mean you don’t get periods where prices are above fundamentals. Melbourne is a different story – their cycle has been going on for a lot longer, particularly their construction cycle. Price activity there hasn’t been as strong as in Sydney but it’s been happening for a bit longer. Investors have been active in Sydney much more than in other states – about 50 percent of housing finance nationally now goes to investors, and that share is much higher in Sydney. So that’s where the concern is from policymakers when they say markets are unbalanced it’s because of that investor activity. We share that view and we think some slowing of investor interest would be a good thing. We see some signs in that house price growth has slowed a bit which should dampen investor interest; household surveys show it’s a less attractive time to buy a home and that’s because prices have gone up, so that should dampen interest as well among investors. We’ve got forecasts that house price growth will slow further over the next 12-24 months. How likely are we to see specific measures to tighten housing lending? It’s up to APRA [Australian Prudential Regulation Authority]…the RBA can only control interest rates, and we’re not seeing them going up anytime soon, so it’s all about what APRA does. The key thing is they’ve been talking to the banks for the past year or so, a point the RBA has stressed recently, so it’s not a steep change in thinking. The newest thing they’ve said is that they’ve been talking to APRA pretty closely and will have a preliminary announcement before the end of the year about some measures aimed primarily at lending to housing investors. Over the next couple of months, they’ll say this is what we’re thinking of doing but it will take some time before it’s instituted. But they’re not really thinking of highly prescriptive measures like restrictions on loan-to-valuation ratios such as in New Zealand. It’s more about making sure lending practices are appropriate, particularly for investors. The federal budget deficit appears set to worsen due to obstruction in the Senate. Is this a concern and what’s your view on where government finances should be headed in the next three to five years? The starting point in terms of our debt is still low, but things can change quickly if the economy is hit by a shock. We haven’t had a recession for a long time but we could have one, and that’s when the budget could blow out. So if you’re unlucky your level of debt could go up by a lot. But in terms of the medium term of three to five years, we share the government’s view that consolidation over that timeframe is a good idea for preparedness reasons. We never thought that a quick reduction in the deficit through discretionary measures was needed as the economic outlook is still a bit tentative for the next couple of years, and they’re actually not doing much in a discretionary sense for the next 12-24 months anyway – a lot of the measures they were proposing don’t kick in for at least another year. So we’re going to get some improvement in the budget if our growth forecasts are right, as they’ll get more tax revenue, including through bracket creep. But we think the government’s view broadly is right – how you do it we might disagree about this or that, but that’s not so important for now. The Australian dollar has depreciated but the RBA still believes it’s historically high. What’s your view on the exchange rate and where it should be, based on the fundamentals? Our strategists are forecasting US$0.86 by mid-next year, and then US$0.83 by the end of 2016. There’s two elements to the RBA’s view: one aspect is we think the currency will come down due to actual and expected weakness in the terms of trade, so that’s a key reason why we think the currency will be lower. The second reason is that we see interest rates rising in the United States before the RBA tightens policy here, so that should drive the U.S. dollar higher. The RBA has said the currency remains higher than normally needed to achieve this transition in the economy…Because things are so unusual, we share that view that you probably need the currency to be a bit lower to support those other parts. Historically, the currency has acted over the medium term as a very good “shock absorber” for the economy. So when commodity prices are weaker, the currency tends to fall and dampen the effect of those lower commodity prices on the economy. But it doesn’t ameliorate the whole effect …we shouldn’t be pinning all our hopes on the currency to be lower and solve all our ills. Its role traditionally has been a shock absorbing role, not stimulatory per se. But it can still be stimulatory for individual industries and businesses. Australia has had a record 23 straight years of economic expansion. Can this continue, and has it been down to good management or just good luck? A bit of both. Australia has very good institutions and the policy frameworks around fiscal and monetary policy have been pretty good. They’re pretty clear and credible. The central bank has an extreme amount of credibility globally, so that shows good management. Certainly there’s been good luck in the China boom or global growth boom, which benefited countries with rocks in the ground, so that’s a bit of luck. But to take advantage of that luck, we had to do things, such as invest in the resources sector, which was taking risk. So that’s hopefully good management by the private sector. So there’s an element of both. How long will it continue? Well no one tends to forecast recessions, which is a big failing of economists, but it’s because they’re pretty rare and difficult to see coming. I think this is where both the [Federal] Treasury and RBA have made some good points – on average you tend to have a recession every eight to 10 years and it has been very unusual that we’ve gone without one for 23 years. There aren’t many countries that have done that in the past…Treasury had a statistic about the longest being 30 years or so. So if we got to the end of this decade without another recession, that’d be record-beating stuff. If we do go through a recession, the key one is how deep – you don’t want it to be too deep. Looking at your policy wish list, what reforms would you like implemented to improve the economy? Where businesses make the most noise is around the burden of tax and regulations, so there’s an element of that that needs to be fixed. These days there’s a lot more you have to do as a business that is regulatory. Maybe because we’ve had it so good in Australia and that regulators and politicians are to an extent always looking for things to do, we’ve been bringing in more regulation and have become too conservative in that regard, so that should be looked at. On the tax side, it’s a no-brainer that our tax mix is not a good one for the future purposes of the country with an aging population. When you have aging populations you need more indirect taxes rather than income taxes. I’m very confident that change will happen over the next decade, and that’s pretty important for the nation’s medium term fiscal stability. Our consumption tax is low by global standards…in retirement people have not much income, but they do still spend. 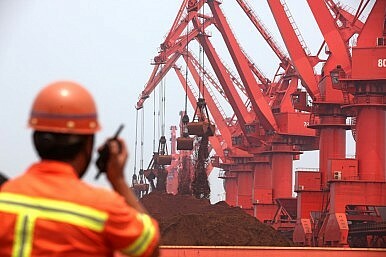 Its dependence commodities exports to China and housing sales leaves the Australian economy looking very exposed.